Taping the foot has long been used to help relieve heel pain, and good scientific evidence exists for the effectiveness of this treatment. However traditionally this heel taping has been complex and best applied by a clinician. This meant that the tape had to be left in place for a while, often a week or so. You had to keep it dry and that often left to smelly feet and itchy skin. The Heel Fix Kit ® Heel Tape, and the technique invented by British Podiatrist Andrew Horwood, removes all the complication of traditional foot taping techniques. Leaving a simple yet effective treatment that can be applied daily by anyone, including the person suffering from heel pain themselves! Now you can apply the tape daily each morning. No need to keep your foot dry. No more smelly itchy feet. The tape is applied with the central ‘U’ upside down facing towards the ground. Make sure the tape is applied over the bony part of the heel, not over the Achilles tendon. The remaining free ends of the tape should now naturally fold under the heel. 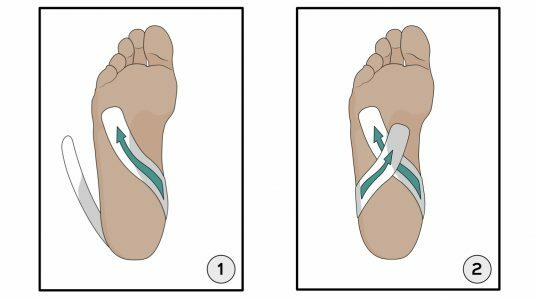 The end of the tape on the inside of the foot should be pulled firmly under the foot crossing the heel towards the outside of the foot. The other end of the tape should now be pulled firmly under the heel, over the other end of the tape towards the inside of the foot. You should be left with a cross under your heel which loops back around the back of your heel. The Heel Fix Kit ® Tape is designed to support the plantar fascia over the most common site of pain. Such taping has been shown to alter foot contours and is therefore likely to reduce plantar fascia strain. 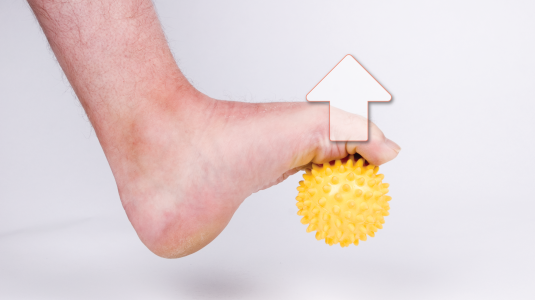 It is highly effective at reducing plantar fascia pain immediately.